The Illinois study recommends temperatures between 40° and 80° Fahrenheit for optimal sealant performance. 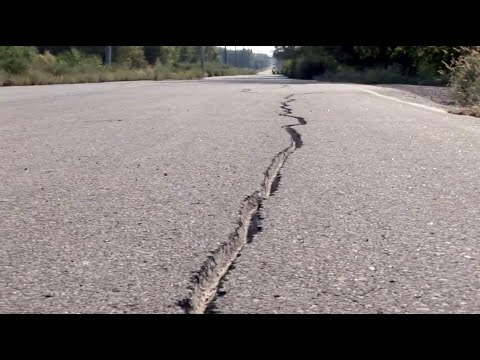 Illinois recommends applying crack sealant in the spring and autumn when cracks are not at their extreme closure or opening. An often ignored step in proper crack sealing procedure, routing can help your crack sealant perform better. Routing creates a uniform reservoir at the crack opening large enough to accommodate movement caused by thermal expansion and contraction. Without this reservoir, sealants cannot handle drastic ground movement and may separate or re-open sooner. “Routing is one of the best ways to ensure that your cracks stay sealed longer,” said Maxwell Products? salesperson, Dave McIntosh. ?When you rout a crack, even in a parking lot, and you cut that reservoir into the crack, it allows the crack to expand and contract better and allows the material to penetrate the crack deeper than it could by itself.? Debris, loose dirt, and moisture can prevent crack sealants from obtaining optimum adhesion, thereby weakening the bond and possibly allowing moisture penetration. The best policy is to ensure you clean the crack of loose materials and dry any moisture that may have collected. Heating asphalt pavement has the added benefit of softening the asphalt binder, providing a better bonding environment for the crack sealant. Use a compressed air blower to clean off the crack walls and the surface around the crack (we recommend a 185 CFM compressor), and use a wire broom to remove any caked-on dirt or loose pavement. Where necessary, use a hot air lance to simultaneously clean and dry the crack, but be careful to avoid burning the pavement, which can create even more problems. Maxwell Products always recommends carefully selecting the right product for the job. The correct sealant for your cracks will meet local specifications, properly accommodate thermal expansion/contraction, and be formulated to perform in the given local conditions. “If you choose the appropriate product for your [geolocation],” said salesperson Dustin Brown, ?you?ll get better performance in setup time, and the material will stay in place.? But how do you select the right material for your area? That can be a complicated question, factoring climate, intended use (highway, parking lot, rural road, etc), direct fire or oil jacketed melters, and more. To get answers specific to your area, call one of Maxwell Products? experienced and helpful sales professionals (like Dave, Rick, and Dustin) at 1-800-266-2090, Extension 2, or go to the brand pages on our website (Elastoflex or NUVO), and get a quick recommendation by entering your zipcode in the text box and clicking on the COMPARE button. Try out these quick and easy tips, and seal pavement cracks even better than before. For more pavement maintenance tips and suggestions click over to our Solution Center, or use the Search box above to find your particular pavement issue, along with potential solutions.